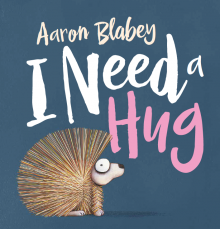 I Need a Hug is a children's picture book, written and illustrated by Aaron Blabey, and published by Scholastic Australia (2015). RRP: $Au 16.99. All the little porcupine wants is a hug. But with such prickly spikes, will she ever get the cuddle she craves? A truly adorable tale from the best-selling creator of Pig the Pug and Thelma the Unicorn. There really are some days when you NEED a hug. That’s how a little porcupine feels but despite asking a range of animals, and calling them by their names, she is shunned, with all of them running away. When they run back towards her, her heart lifts because she thinks they may have changed their minds. Instead they are running FROM someone, a snake. It turns out that all the snake did was ask for a kiss. The two realise they can be friends, a powerful and heartwarming moment. Blabey has written in rhyme, and the text is simple and clear, making it ideal for kids 3+. Font is large and characters stand out on plain coloured backgrounds. His trademark big eyes are expressive as usual. I loved the porcupine with her spaghetti straight spikes - especially on the last page where she and the snake curl into a careful cuddle. There’s lots to discuss in I Need a Hug. Kids will understand the problems involved with spiky quills, but they’ll also empathise with a character who's trying to be friendly, only to be rebuffed. Some people’s spikes aren’t even physical, but it still makes it hard to get close to them. It’s a great picture book for schools to add to their collections, and for libraries everywhere.